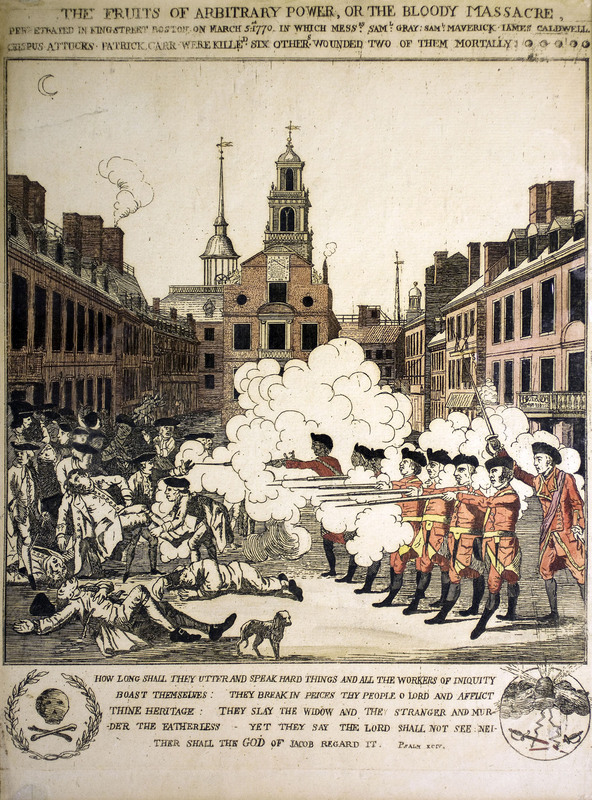 Henry Pelham’s Fruits of Arbitrary Power, or the Bloody Massacre, after Paul Revere. ; framed: (31.5 x 22.5 cm). Link to record. Brigham plate 13. Link to Brigham. A framed and hand-colored bordered engraving featuring regimental British soldiers firing guns into a gathering of colonists. Scene features the American colonists to the left and the British regiment soldiers firing rifles with bayonets to the right. There are eight soldiers, all wearing red coats and hats with one of their legs extended forward. In the foreground, behind the regiment, is the British commander, Captain Preston, with sword raised. Between the soldiers and colonists is a thick cloud of smoke; two pair of legs are visible beneath and to the left in the distance two men can be seen fleeing the scene. Integrated into the crowd are colonists in various states of panic and casualty from gunshot. Three are prostrate on the ground and bleeding; two shot in the head, and one in the chest. Two men help another wounded man away who has been shot in the chest. A fifth man in the background is bleeding from the head. One man extends his arm towards the soldiers, one man looks away from the scene with a hand in his pocket, another figure has a cloak draped around his/her shoulders and arms clasped is in the shadows. In the foreground is a dog. Text above reads “The Fruits of Arbitrary Power, or the Bloody Massacre perpetrated in King Street Boston on March 5, 1770 in which Messrs SamL Gray, Saml Maverick, James Caldwell, Crispus Attucks, Patrick Carr were Killed Six others wounded two of them mortally.” Next to this are five shaded dots. In the background are several buildings including the Custom House with balcony; in the center is the State House with clock and central balcony; above is a clear sky. To the left is a raised steeple of the First Church with clock and cupola, and a chimney billowing smoke as well as a crescent moon facing right in the upper-left corner. Text beneath is flanked by two motif images; a skull and cross bones encased in a wreath to the left and to the right, a circle with a cloud bank and lighting breaking apart two crossed swords. Text between them reads “How long shall they utter and speak hard things and all the workers of iniquity boast themselves: they break in peices [sic] they people O Lord and Afflict Thine Heritage: They slay the Widow and the stranger and murder the Fatherless – Yet they say the Lord shall not see neither shall the God of Jacob Regard It. Psalm XCIV.” High-resolution scan available for order: 002097-0001.